Today i'm gonna show the template method design pattern in action. 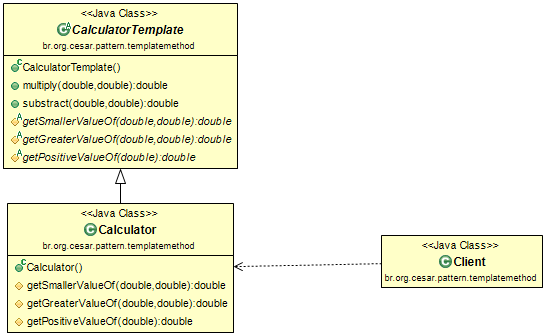 The template method design pattern is a very common when we are developing structures and base classes for a framework. In our example we will develop a base class with some template methods for all derived concrete calculators. But what are template methods and why shall i use it? Well, think about some operations that must be implemented in a specific way. And you want to ensure it. That's a good reason for it. Another reason is to define the same contract for all instances. And finally because of the DRY principle. (Don't Repeat Yourself) The abstraction will put the code in a central place. This is good for maintance. A further advantage of it is that the javadoc can be placed in the abstraction only once and must not be repeated also in the concrete implementations. Now let's say you want to implement a bunch of different looking calculators. With this abstraction you could it. That's all! I hope you like it!